"No department seems to be exactly “fit for purpose”, although the Home Office is unique in being "well placed" in none of the [performance] categories measured." 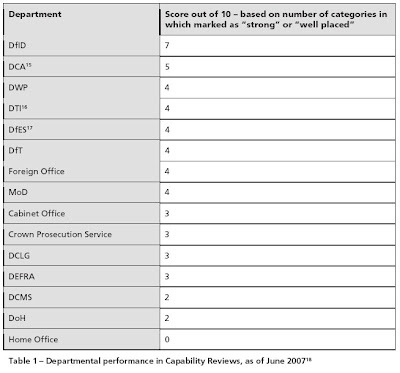 The PASC examined the Cabinet Office departmental Capability Reviews (see previous blogs eg here), and concluded that most of Britain's government departments are pretty well useless. Before continuing, just take a couple of moments to digest that table. Only one department even scores above half marks. The average is a dismal 3.5 (or put another way, an overall Civil Service score of 35%). "Launched in October 2004, PSG is a major, long-term change programme designed to ensure that civil servants, wherever they work, have the right mix of skills and expertise to enable their departments or agencies to deliver effective services. To this end, its goal is to move away from the concepts of “generalist” and “specialist”, and create a Civil Service where all staff are specialists of one form or another... The aim is to professionalise the business of government." (Report para 39). There's only one problem: it's all been tried before. About 300 times. Indeed, as the Committee points out, the 1968 Fulton Report spawned virtually identical ideas and plans. They say: "The great mystery remains: if so many of Fulton’s recommendations were (eventually) implemented, why are the same criticisms still valid?" The reality is that government's dysfunctionality goes much deeper than not enough "professional training" for top civil servants. The government simply does not have the excellent management its micro-managing policies demand. This government is very keen on Delivery. Well, it's very keen on talking about it anyway. But the Cabinet Office Capability Reviews show that actual delivery is Very Poor Indeed (the overall Civil Service score is just 24%). Why? As we've blogged many times (eg here), bright people join the civil service because they want to get their hands on the levers of power. And that means policy work- advising ministers in time honoured Sir Humphrey style. What bright people do not join for is delivery work- ie running some dreary concrete hanger full of demotivated temps on an industrial estate miles from the ministerial corridor. It's simply not how they want to spend their lives. It's the nature of the beast- those who want to run dreary concrete hangers etc go to work for Tescos and get a load more money, a load more prospects, and a load more esteem. Governments are forever telling us they are fully committed.Fully committed to programme X or programme Y, and determined to see things through. In reality, staff turnover at the top- where commitment really shows up- is horrific. The Committee reports that "the average tenure of a ministerial post under the current Government has been 1.7 years, and that for Cabinet posts 2.2 years... the Senior Civil Service median is 2.7 years" (para 136). In government, whether as a politico or Civil Servant, the only way to get on is to move on. Which is devastating in terms of the actual job. As we've pointed out many times, in the last two decades Tesco has had just two Chief Execs, both of whom spent their entire careers with the company, working their way up from the dreary concrete and the baked bean stacks. In the process, they became world experts on retailing and were ideally qualified to lead Tescos to its current dominance (see also this blog). Let's understand that. We can't have experts in charge of things because of political accountability to Parliament. That's so valuable, it's worth suffering in a way that other countries don't. Even though in reality we have an elected dictatorship with vitually no meaningful parliamentary accountability whatsoever.